Analog Artist Digital World: Art Opening at Maxine's on Shine. Right before Valentine's Day I went to Maxine's on Shine (337 Shine Ave, Orlando, FL 32803) for an art opening. The art for the evening was all predictably heart shaped. All of the canvases had a heart or several hearts as the center of interest for the composition. This local eatery has always supported local artists. I had a solo show there several years ago and it was a great experience. All of the nails used to hang the art are in place so hanging a show can take less than an hour. There is no careful measuring or aligning works along a line. The artist was Ronda Richley. She paints with a heartfelt passion. Pieces are priced up to $12,000. 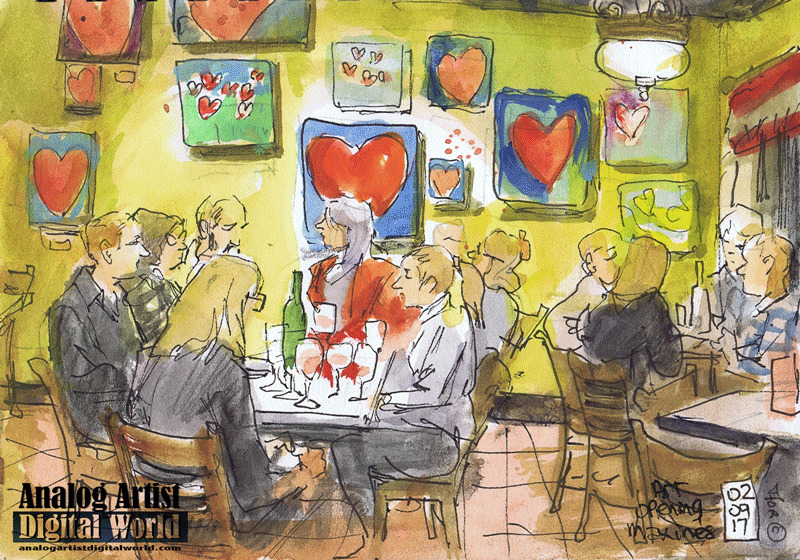 Artists were gathered around a table top showing their support for the art on the walls. The wine flowed and conversations flourished. Other heart art was by RV (Robin Van Arsdol), a local urban artist who had a book which featured his wor, along with renowned artists like Keith Haring. I flipped through the book, excited to see the graffiti art work from the booming 1980s.